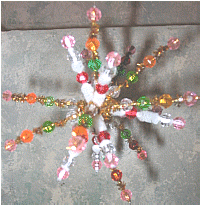 Here’s a beaded star tree trim to add to your homemade Christmas ornaments. So quick and easy to do, you’ll want to make lots of them in different colors of beads. Remarkably easy, but a lot of fun to make! You can vary the look of these homemade beaded stars by changing the colors of the chenille stems and the beads, both of which are available at most dollar stores for a reasonable price. You will need five chenille stems for each star and beads that fit snugly on the chenille stem wires. Simply cut five colored chenille stems into 4-1/2″ lengths (gold looks nice and adds glitter). Cut five white chenille stems into 3-1/2″ pieces. Lay three of the colored stems on the table, top with the five white stems and then with the last two gold stems. Wire these together in the center with a small piece of either colored stem, and snip of the excess wire. Fan out the star “rays” in all directions, alternating colors. Now slip beads in place, allowing some space between beads, and following an orderly pattern. For instance, in the larger photo above, the star has a red bead placed on each white stem, which is then topped by a transparent bead and a pink bead. The gold stems had transparent, green, gold and pink beads threaded on, in that order. A huge amount of creativity is possible with this small Christmas craft. You may decide to make an all golden star, with only gold rays and golden beads; or a twinkling star with gold and silver rays and only transparent or silver beads. There’s also a wide variety of colors available in most craft or dollar stores. These beaded stars look nice as accents on a garland, but with the finished size being 4-3/4″ in diameter, you should also have plenty of room on your Christmas tree for an assortment of beaded ornaments!